In 2004 “the greatest Dutchman of all times” was elected. Wilhelm von Nassau und Schloss Dillenburg won the contest. Remarkable, because Wilhelm and his brother Adolf are as Dutch as Würstl mit Sauerkraut. They were Germans. 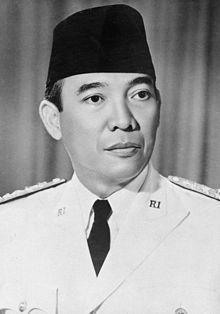 Sukarno undoubtedly was citizen of the Royal Kingdom of the Netherlands and with the proclamation of August 17, 1945 he led 70 million people to freedom and the inlanders of the Royal Kingdom of the Netherlands ultimately became citizens of the young Republic of Indonesia. An unrivaled accomplishment. – In the middle of the map, the Asian part of the Former Dutch Empire, now Indonesia. 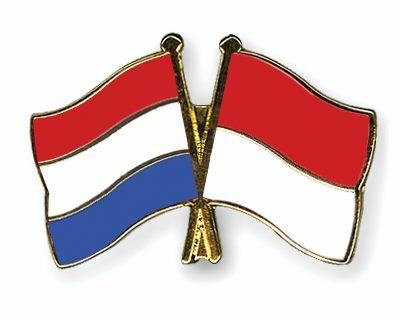 – Left side: the European part, often simply called ‘Holland’. In Dutch history books it is written that general elections and democracy were introduced in the Royal Kingdom of the Netherlands in 1919. This is incorrect: 70 million citizens in the Asian part of the kingdom had no voting rights and this would remain so until the formal and final disintegration of Former Dutch Empire on December 27, 1949. With this act (officially: “Law on Dutch citizenship“) about 99.99% of the inhabitants of the Asian part of the Former Dutch Empire were excluded from civil rights. Only those who could prove having a European father or being a natural child of a European mother, were eligible. The people without rights were called ‘inlanders’. Apartheid is not only the most known Dutch word worldwide. Apartheid was legally embedded not only in the legal system of South Africa, but in the Royal Kingdom of the Netherlands until 1950 as well. 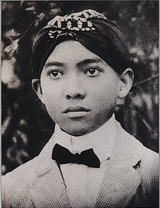 Kusno Sosrodihardjo was born on June 6, 1901 as son of a Javanese teacher and his Balinese wife. According to Javanese tradition he received his new name after surviving all teething: Sukarno, which means “good karma”. In 1916 he went to the Secondary School and then graduated as an architect from the Technical University in Bandung. (in the period 1933 – ’40 despite the Ethical Policy only 189 ‘inlanders’ graduated) Sukarno had a photographic memory and spoke fluent Javanese, Sundanese, Balinese, Indonesian, Dutch and reasonable German, English, French, Arabic and Japanese. Resistance to the unjust system of apartheid was inevitable and it was Sukarno with some others who founded the Partai Nasionalis Indonesia (PNI) on July 4, 1927. Article 2 of the party program left no room for unclarity, “the pursuit of the independence of Indonesia ‘. Dissidents were often deported to concentration camp Digoel without any form of trial. The Governor-General could use his ‘exorbitant rights’ at will. However, in 1930, the authorities opted for a different approach. Sukarno was arrested “in the name of the Queen!” and imprisoned in the Bantjeuj prison in Bandung. A trial started with the hate-sowing article from Dutch-Indies Penal Code. Another article that was written in the subpoena: Art. 169, “participation in a criminal association”. Sukarno was found guilty and incarcerated in the Soekamiskin prison near Bandung. On December 31, 1933 he was released and came out “as a Kris only cleaner and sharper than before,” as he described it. After the mutiny on the Zeven Provinciën Sukarno was again arrested and exiled to Flores and in 1938 to Bengkoelen on Sumatra. There he was liberated by the Japanese in 1942. On August 15, 1945, after the atomic bombs on Hiroshima and Nagasaki, Japan surrendered unconditionally. This had a major impact on the Asian part of the Kingdom of the Netherlands. The central government in The Hague wanted to regain control over the Asian part of the kingdom from the Japanese and independence pronounced by Sukarno on August 17, 1945 was not recognized. The monarchists from Europe sent 150,000 soldiers to supress the secession efforts of tens of millions of it’s Asian nationals. On 19 December 1948, Sukarno is arrested for the third time by units of the Korps Speciale Troepen. 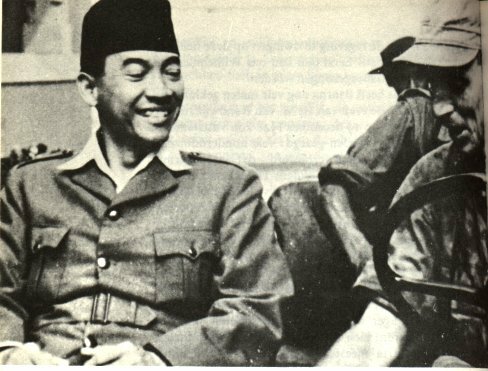 Photo December 19, 1948, Djokja: a smiling Sukarno shortly after his arrest. Next to him KNIL-captain Vosveld. The monarchists won the battle but lost the war that was not supposed to be called a war (just a ‘policing action’). The monarchist elite in Europe simply wanted that everything in 1945 would be the same again as prior to the Japanese occupation: Dutch East Indies as a wingewest (region for making profit), but literally the entire world sided with the Republicans and condemned the old colonial rulers in The Hague. The predominantly Christian monarchists should be grateful to Sukarno however: thanks to him, the Kingdom of the Netherlands is no longer the country with the largest Muslim population in the world. Posted on August 15, 2013 by 7mei.nl. Bookmark the permalink.